Natalie has changed ALOT over the past few months. 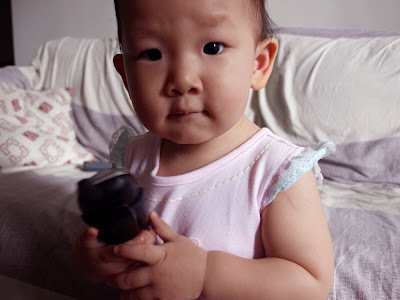 Not only has she developed physically and is bigger and sturdier, but she is also better at picking raisins out of buns, timing her kisses, and walking further distances. Every day, you can almost physically see her learn new things such as perfecting how to throw a ball and what new words are for new things. She's even started saying "Nyo nyo" while shaking her head. However, despite all these changes, one thing remains the same: her love of the telephone. 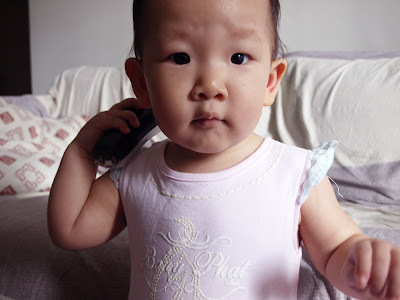 Here are some photos of her chatting (she really babbles) into the telephone. 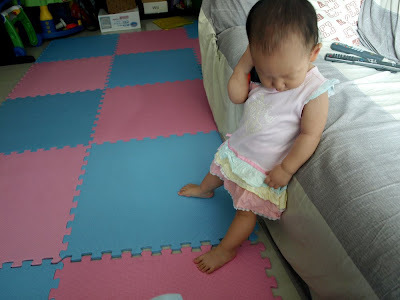 Natalie casually chatting on the phone. Natalie says: Um, excuse me, but I'm on the phone right now. Can this papparrazi stuff wait a few more minutes? She really enjoys the phone. She can turn it on and listen to the dial tone (and the orange light comes on when the phone is on). She hasn't figured out how to turn it off yet. 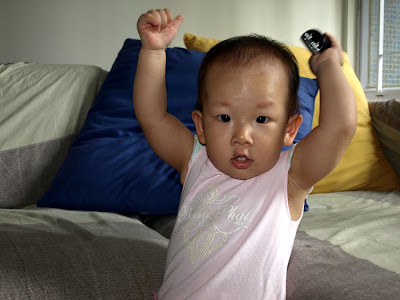 When I start singing "Twinkle twinkle little star", Natalie raises her hands high over her head to do the "twinkle" action. As you can see, the phone stays firmly in her hand.